This post on old broken men comes via Mario Mendoza when he asked about a few pitchers. While I won’t cover all the pitchers today, McCarthy and Ryu intrigue me because they’ve been productive in the past but injuries cost them most of last season. While not listed, Lance Lynn and Brett Anderson fall in the same category. As a group, they averaged 15 IP in 2016. Here is a quick take on all four. Wow, I hope the other pitchers will be easier to analyze. McCarthy has been consistently inconsistent. I will start with the basics. His fastball’s averaging 93.2 mph. He’s been at this higher velocity the last four seasons after averaging around 90 mph before 2014. From 2014 to 2017, McCarthy has posted a 4.22 ERA (3.80 FIP) with an 8.4 K/9 and 2.2 BB/9 in just 275 IP. An owner needs to start with these values as a baseline projection. This four-year history is almost identical to his Steamer projection which is similar to Steamer’s 2017 projections for Marcus Stroman and Kenta Maeda. I am not that enthusiastic about him but maybe I should be. At Fantrax, his ownership rate is 45% which is just less than James Shields and Ricky Nolasco. He should be owned much more than these two. He should be universally owned in probably all leagues will still healthy. Ryu can probably be bought for a song after posting an 11.57 ERA in 2016 and his 5.79 ERA this season. Owners need to look and see these values were accumulated in just 14 innings. In 342 innings in 2013 and 2014, his ERA was near 3.25. His fastball is down 1.6 mph (with adjustment) which equates to ~0.37 rise in ERA. His fastball quality could have dropped to the point where it gets hit around. All the recent damage against him is off this subpar fastball (at least 1.700 OPS vs in the past two seasons). This pitch needs to improve. He’s probably worth a stash to see if he can re-establish his 2014-2015 production levels but I would not start him right now. His fastball might not be good enough to cut it in the majors. I had high hopes for Lynn coming back from Tommy John surgery but as I dug into his profile, I’ll pass on him for now. 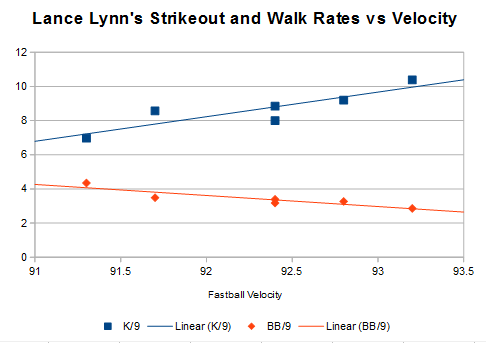 Lynn relies heavily on his fastball (77% career usage) and after returning, it is down ~0.7 mph. Lynn’s production has sagged each time his fastball speed has dropped. Here is a plot of his yearly fastball velocity versus strikeout and walk rate. The approximate 7.0 K/9 is workable but not with a 4.4 BB/9. This production level puts Lynn into the same camp as the 2016 versions of Jimmy Nelson, Tom Koehler, Hector Santiago, and James Shields. Obviously, the comps aren’t good. There may be some hope for owners who can wait. He’s throwing his changeup more which could keep hitters off balance. Additionally, he may gain some control back as he gets further away from his surgery. There’s just no way to know right now. He’s a stash-and-sit at best for me. There are other pitchers probably on waivers I would rather take a chance on. Sell, sell, sell … if you can. His 0.84 ERA looks nice for now. His corrected velocity is ~2 mph less than his 2016 value. The Cubs defense is going to need to be elite again with the new velocity loss. Steamer has him projected at 6 K/9 and 3 BB/9. I think these may be generous and better than I would project (currently at 5.0 K/9 and 4.0 BB/9). These values are not playable in today’s game. Last season, Edison Volquez tried and posted a 5.37 ERA. We hoped you liked reading Old Pitchers With Fresh Starts: McCarthy, Lynn, Ryu, & Anderson by Jeff Zimmerman! Thanks! I looked at the velo differences upon return for them as well, and immediately ruled out Ryu. I’ll add to list that Corbin’s velo is indeed up 2mph, as was reported in ST. Wheeler is down ever so slightly. I went with those two. They are in their “primes.” Wheeler is in a crowded rotation but I’ll bet *against* all of Matz, Gsellman, and Lugo keeping him out.